Transforming your marketing to survive and thrive in the digital future demands a fundamental reimagining of how marketing engages and adds value to a business. This isn’t about just changing work processes or exploiting new technologies. It is all-encompassing and needs a carefully-crafted and well-documented plan that touches all parts of the business. This excerpt from an ITSMA study, Accelerating Marketing Transformation with ITSMA’s Maturity Model, describes a model based on extensive research among members about how they are grappling with such big issues. 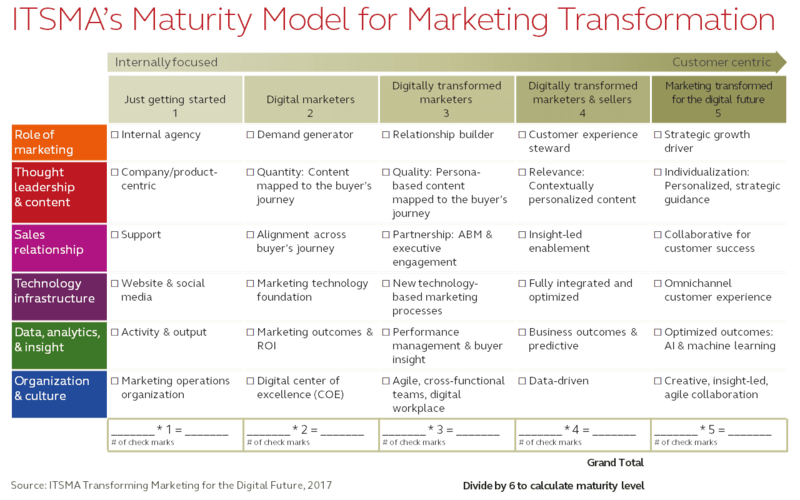 The model can help marketing leaders begin to chart their own course toward maturity. We have identified six critical areas of change that need to be addressed as part of transformation initiatives. 1. The role of marketing: becoming a driver of strategic growth. Marketing must increasingly become a strategic growth driver both in the core business and with new offerings and markets. ITSMA research has shown that eighty percent of B2B marketing teams are taking on more strategic responsibilities and expanding their operational scope while still handling their traditional activities. Become more customer- and issue-centric rather than product-centric. Be seen as thought leaders rather than market followers. 3. Sales relationships: emphasizing collaboration throughout the client lifecycle. Greater alignment and cooperation is essential in what has been at times a tense relationship between marketing and sales. Account-based marketing, among other initiatives, has helped. But there is further to go in fostering seamless collaboration. 4. Technology infrastructure: bridging the digital and physical worlds to create a seamless omnichannel customer relationship. The research found that most B2B teams have developed the foundation for digital marketing. But the emphasis must start to shift toward implementing a whole new set of skills, investment, and integration to prevent being overwhelmed by tools and technologies, and to get everyone up to speed. 5. Data, analytics and insight: leveraging data, artificial intelligence (AI), and machine learning to optimize business results. This calls for careful integration of the new tools, skills, and processes having such an impact on the way we work. B2B marketing has begun to reshape itself with real-time data, automated insight and decisions, as well as process optimization for both efficiency and impact. This will go some way toward silencing those skeptics of marketing’s contribution to value. 6. Organization and culture: developing a digital, agile, insight-led, and creative team. B2B marketing leaders are breaking down functional silos and speeding up time to market through more agile and collaborative ways of working. The next stage will be to take advantage of the new art and science of marketing and work even more fluidly and effectively across the entire business. Organizations look dramatically different than they did two decades ago. For B2B marketers, the last 20 years have been all about developing digital capabilities, practices, and tools: shifting from print and events to email, social media, online interaction, and gathering and using data to create increasingly personalized connections. But this could be merely a foretaste of what is to come and how marketing’s role will have to evolve, acting as a catalyst for change. The ITSMA Transformation Maturity Model enables you to map out the direction you should take to reach the digital future successfully. For the complete study, including case studies, see Accelerating Marketing Transformation with ITSMA’s Maturity Model. This document is available at no charge to ITSMA members (password required) and for sale to everyone else.